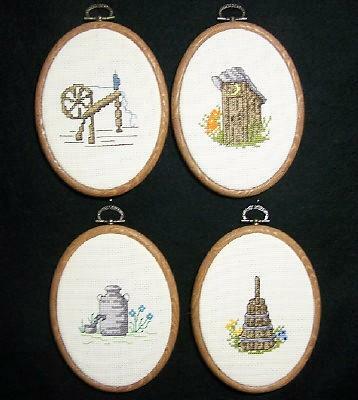 This is a set of 4 cross stitch hangings. They are definitely country. An outhouse, churn, milkcan with ladel, and a spinning wheel. I cross stitched them personally. The frames look like wood but are actually a stiff rubber with a decorative hanger on the top. 6" high x 4.5" wide. Just really cute and different.